I decided to take the Multigrain Bread Extraordinaire and make dinner rolls. I used cornmeal, rolled oats and wheat bran as my soaker. Tried microwaving the brown rice, but wasn't very successful. Better to reserve 3 T. brown rice from your next meal and freeze it for this recipe. The result was a sweet, flavorful bread with a tight crumb. I will probably not make this bread again, as I have my favorite Multigrain Bread recipe that uses a cracked grain cereal and is much easier for me to make. I decided to try making Brioche for Thanksgiving. I found these pans at my mom's house. Even thought they aren't *ahem* brioche molds, they are close enough for a trial. I used the middle class brioche recipe and even made the "cap" on top of the roll. The rolls came out buttery and flaky. I even *gasp* put butter on it. Trust me, you don't want to know how much butter goes in this recipe. The verdict? Although light, buttery, and airy, it wasn't my favorite dinner roll. They are best fresh from the oven and tended to be drier the next day. I'll stick with my tried and true Dinner Roll recipe. Next in this roundup is Pizza Napolentana. 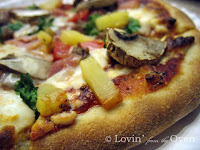 This recipe, with an overnight retardation, makes the best tasting and easiest pizza crust. the dough is shaped, baked for 5 minutes, taken out, buttered and sprinkled with Salad Supreme and mozzarella cheese. Then it's put back in the oven for 4-5 minutes until the cheese is brown and bubbly. I "parbaked" (Parbaking means cooking the bread until it barely starts to change color ~ around 4-5 min.) 20 of these pizzas for my son's 17th birthday party. All his friends had to do was put on the toppings of their choice and I baked them for an additional 4-5 minutes or until the cheese was brown and bubbly. The crust browned beautifully on the bottom. Invest in a pizza stone, if possible. Here's a shot of my hubby's pizza. So, folks, if you love bread and want to learn how to make the BEST pizza crust ever, and many other fabulous breads, buy The Bread Baker's Apprentice and come join the group from Pinch My Salt ~ you'll be glad you did! I'm so glad you linked to your other multigrain recipe - I was going to ask you for it! I didn't love the taste of the brioche, either, but I'm impressed with how great yours looked! I can't wait for Pizza Napolentana! Looks delish!!! So glad you're still in the game. I've been taking a break over the Holidays but will be back in January for the sourdough series. Happy Baking! Could you please explain the parbaking part to me? 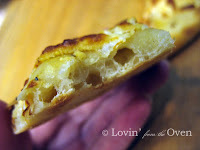 I'd like to make the Pizza Napolentana this weekend and your pizza's crust looks DELICIOUS!!!!! ap269, I am stalking...er...following you now! Parbaking means only to cook it part way through the full cooking time. I made the pizza last weekend (http://ap269.wordpress.com/2010/01/13/bba-challenge-25-pizza-napoletana/)and tried the parbaking version. It worked fine, the only thing that was weird: they were inflating like pita dough. 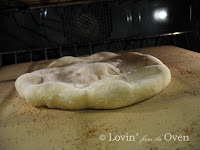 Does that happen to you, too, when you parbake pizza crusts?